After stopping a Detroit Lions' fake field goal attempt, down 23-27, the Pittsburgh Steelers went on to score two unanswered touchdowns - clearly a product of momentum - and win the game 37-27. When the Lions faked the field goal, I was a little bit baffled. Normally, inside the 10 or so it makes sense to go for it because even with a failure, opposing offenses are pinned so deep in their own territory - depending on distance-to-go. 4th-and-5, with vertical space restricted at the 10-yard line, is not an easy conversion; it converts league-wide around 36%. Based purely on efficiency (not including time remaining or score differential), a field goal results in greater return (+0.16 EP over going for it). It's not a huge difference, as the break even point is only 39% conversion probability. But, in this case, the Lions were up four and a field goal goes a long way toward winning the game. We see it again: being up four is suboptimal toward the end of the game. Here, with a made field goal (which converts at 94% from the 10), the Lions' win probability increases to 82%. With a successful conversion, that increases to 87% making the break-even point an unrealistic 66%. Fakes can increase success rates due to their surprise nature (five-yards to go is successful around 46% on a fake, but the lack of vertical room would diminish that probability). And often, fakes occur because of a specific game plan where the offense recognizes a trend or vulnerability in the defense. Jim Schwartz stuck by his "gutsy" decision, and maybe he had seen something to lead him to believe his conversion probability was much higher (or believed his win probability was in fact much lower than a league-average baseline). While I do not think momentum from the failed conversion had anything to do with the Lions ultimate loss, the decision itself was a little bit puzzling given the game situation. After a fumble on the fake attempt, the Lions' win probability was at 70%. Big Ben and the Steelers then drove 97 yards down the field for the go-ahead touchdown. So up 3 this would be good, but up four not so much. great point Keith. 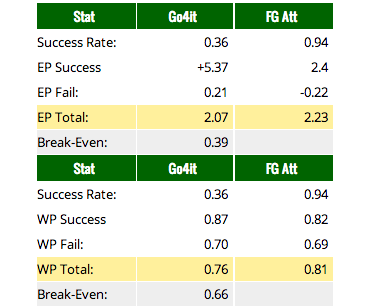 the probability of that play succeeding really had nothing to do with the 10 year league average of fake punt plays. Schwartz's estimate of that success probability was probably far more accurate than a current GWP model. There could easily be a 20% difference, or maybe 30% or 40%. Up 3 with that much time left I would probably still kick the field goal, but it's a closer decision point. Under about 6 minutes left, it makes more sense to fake it. Because of poor conditions, the sequence FG,TD,FG was less likely than usual. The fake was successful! He got the first down.. and then promptly fumbled. In my mind Schwartz made the right call. Going for it is the best play in the nfl, tied with the fake punt. It brings excitement to the game if it works or not.